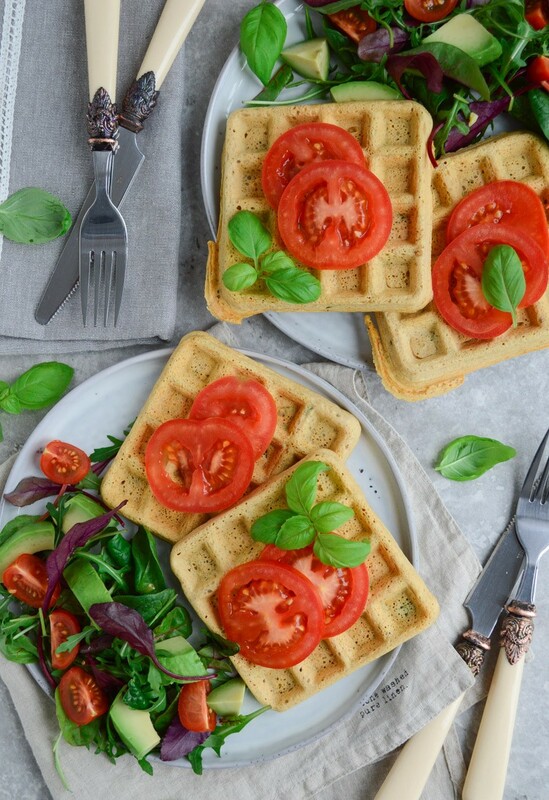 With just a handful of ingredients, these gluten free vegan chickpea waffles are a quick yet healthy fix for breakfast or lunch and can be enjoyed either with sweet or savoury toppings. You can use them instead of bread in your favourite sandwich too. Healthy, versatile, quick & easy. Finally, after a long 4 week break from the blog, I’m back! I must admit, I’ve had one of the worst cases of ‘post holiday blues’ yet… It’s been so hard to get back into the daily routine after a fun filled 2 week vacation in sunny Florida. With so many thrilling experiences, as well as utterly relaxing and doing-nothing-for-the-whole-day beach days, Florida took my breath away. I’ll write a separate travel post about our Floridian adventures as I’d love to share some gems of the places we discovered along the way. 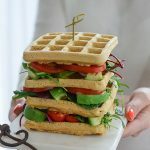 As expected, there are so many recipes I want to share on the blog by now, so I’ll get straight down to business, aka these quick and easy vegan chickpea waffles. 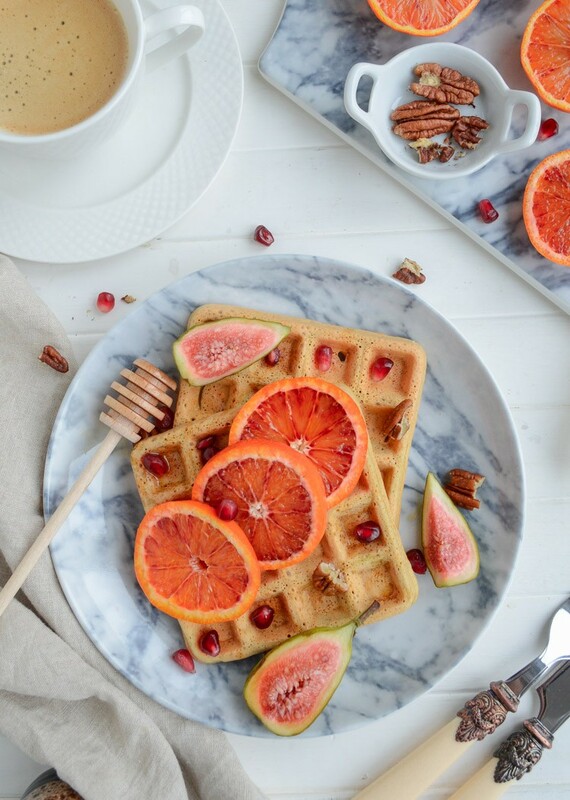 I love how versatile this recipe is – you can choose to serve the waffles with sweet or savoury toppings, which makes it a perfect breakfast or lunchtime recipe. 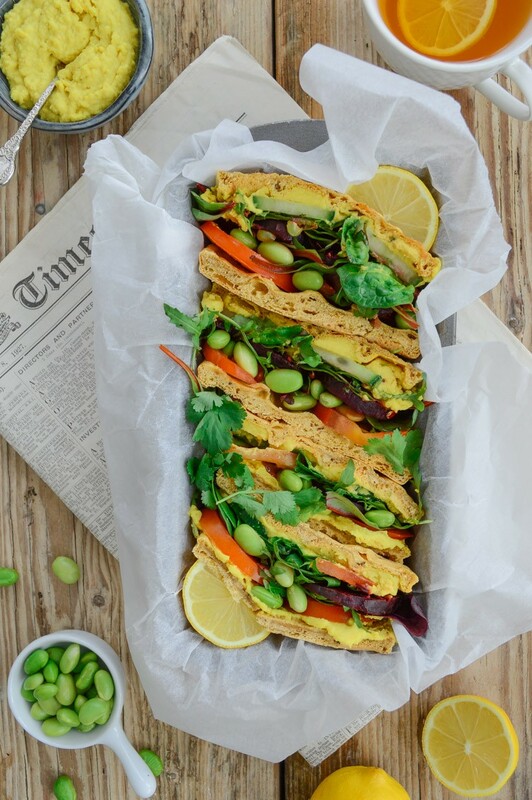 I particularly like using these chickpea waffles in sandwiches instead of bread, especially when they’re generously covered with delicious hummus (like this cauliflower hummus or butternut squash hummus for example) in between all the other sandwich goodness! These waffles freeze really well too – just thaw them out (I normally do it overnight) & put in the toaster for that crispy crunchy finish. Another great thing about this recipe – you can put your own twist on it by adding your favourite spices into the batter. Smoked paprika, mild curry powder or Italian mixed herbs – the combinations are endless. As always, thank you for your support and for taking the time to visit my blog. I hope you enjoy this recipe. 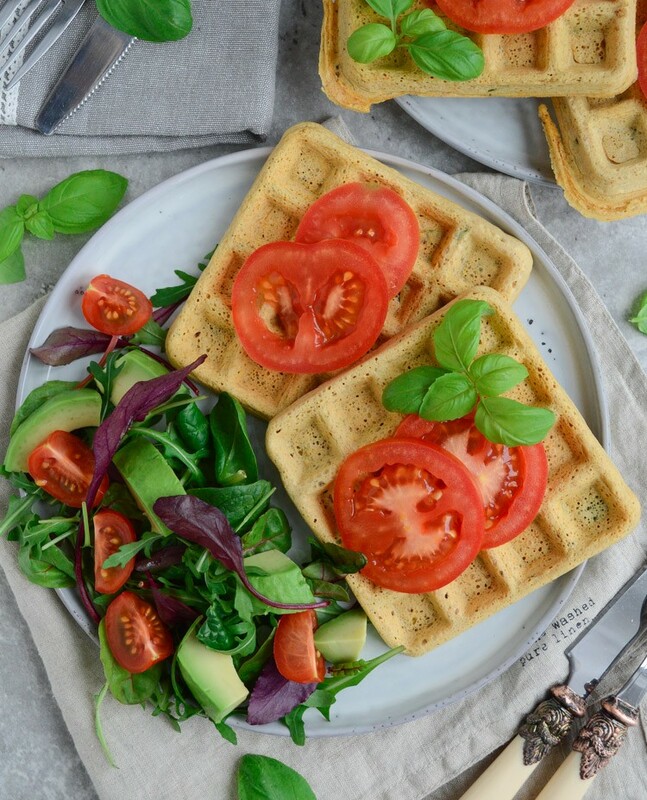 With just a handful of ingredients, these gluten free vegan chickpea waffles are a quick yet healthy fix for breakfast or lunch and can be enjoyed either with sweet or savoury toppings. You can use them instead of bread in your favourite sandwich. Healthy, versatile, quick & easy. 1. Mix all ingredients and let the batter sit on the side for at least 10 minutes. Alternatively, you can prepare the batter the night before and store in the fridge overnight. 2. Heat the waffle iron and grease with a little coconut oil. Pour the batter into the hot waffle iron taking care not to overfill around the edges. 3. 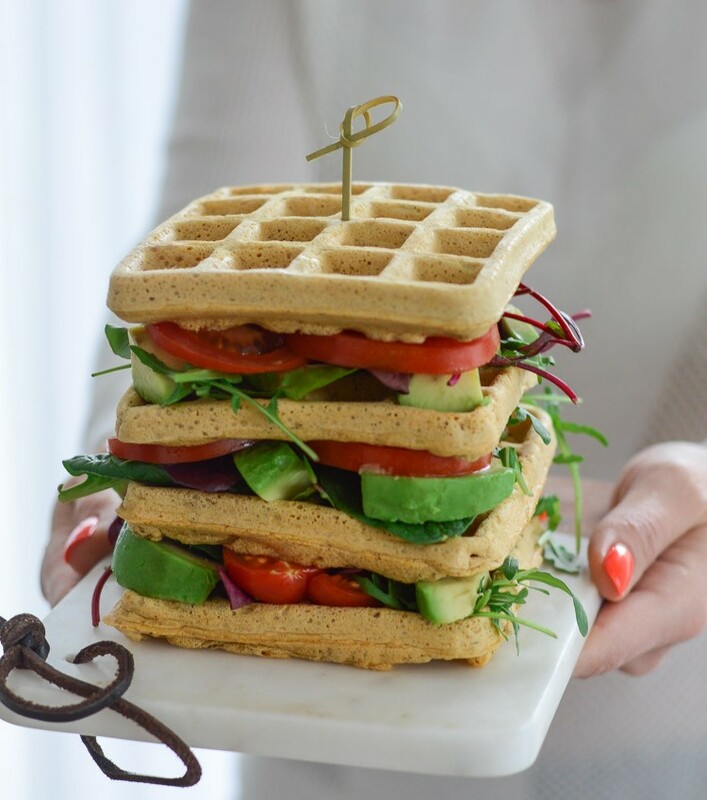 Top the waffles with your favourite toppings or sandwich fillings and enjoy whilst still warm. I love savory waffles! What a great idea to make them into a sandwich!! Totally trying this! I can’t wait to try the savory option. These look incredible! Ohhh, this is genius! We haven’t experimented too much with our waffle maker, so I can’t wait to try this. I LOVE savory breakfasts. We also happen to have a ton of chickpea flour right now, so it’s too perfect! This is such a great idea for a sandwich! Love all the different topping ideas too. Thank you so much Nicole. I can’t wait for the picnic season now! Thank you Jasmin. Chickpea flour is on my top list of flours to use – it’s so versatile! Such an amazing idea. Chickpea flour is just so versatile. I have to try these! Looks like a great breakfast. Can’t wait to try it! Thank you so much Jason. I hope you enjoy the recipe. Has anyone actually cooked these, or do they just gush about how they can’t wait to try? Why are these people so desperate to get on the net saying nothing?